Designed and assembled in the USA. - Every item is made to order. Due to the handmade nature of our products, no two pieces are exactly alike. All shapes, sizes, and colors will vary slightly. Our mosaics are made of hand-cut and hand-laid tiles of stained glass, the same material used in cathedral windows, and tumbled marble, a timeless and elegant medium. Our unique molding process sets our pieces apart from other mosaic products. This method leaves the top and sides of the table completely smooth, with no jagged edges. It also prevents the stone and glass pieces from popping loose. We have worked closely with a glass-fiber reinforced pioneer who has over 30 years experience in the building industry to introduce a new proprietary blend to our tables. We use an acrylic polymer and water reducers, along with alkali-resistant glass fibers, to create a matrix with improved freeze/thaw resistance, crack reduction, and initial and long term strength. We then incorporate recycled glass beads to provide a light-weight composite for easier handling and delivery, without adversely affecting the quality of the finished product. 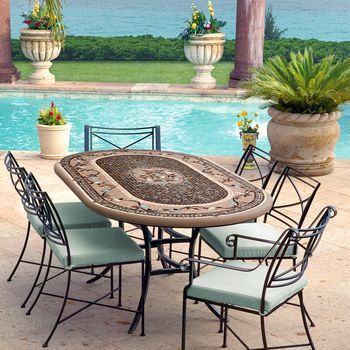 Our tabletops are made for indoor and outdoor use. We do suggest, however, that they not be exposed to freezing weather. Under these conditions, we recommend either covering the tabletop or bringing it indoors. Due to the natural expansion and contraction of cement, hairline cracks may occur. This is completely normal and will not affect the stability of the table. Hairline cracks can be filled by applying a thin layer of grout, and wiping clean with a damp cloth. Our tables have been sealed with a penetrating grout sealer to resist staining. Tables should be resealed seasonally. If tops are marked or bumped, fine sandpaper may be used to remove the scuff. Be sure to reseal the area after sanding. 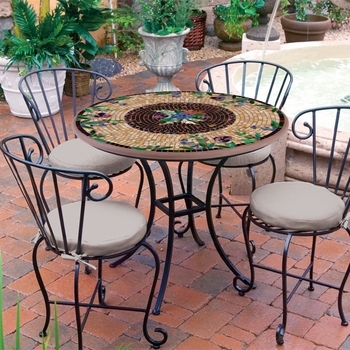 To clean the tabletops, use a non-abrasive cleaner made for natural tile or stone. On the stained glass tabletops, you may finish with a glass cleaner to bring a shine to the tiles. Our iron products are forged and wrought by hand. Our artisans still form each piece with the same tools blacksmiths have used over the centuries - a hammer, an anvil and red-hot iron. 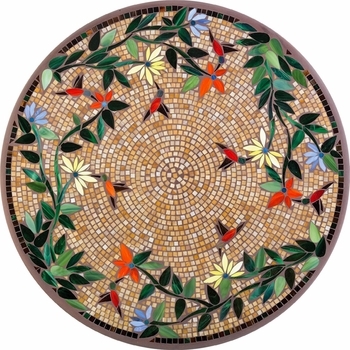 Our mosaic table tops feature hand-cut tiles made of opaque stained glass (durability proven in cathedral windows), marble and or travertine (a timeless and elegant medium). Tiles are then meticulously placed by hand creating designs that range from sophisticated botanicals to classic geometrics. Our tops are cast into our proprietary stone blend that creates a matrix of superior durability. We also incorporate environmentally friendly recycled glass beads to provide a lighter-weight composite for simplified handling and delivery, while at the same time enhancing the quality of the finished product. Our unique molding process provides perfectly smooth tops and sides, ensuring one never has to endure a sharp edge or jagged piece as is found in common, typically made mosaics. When cared for and maintained properly, this rare combination of elegant beauty and lasting durability will enhance and enrich any environment for years to come. Our tops are treated with a penetrating grout sealer before they arrive to you. Tops need to be resealed 1-2 times a season. Sealing the top helps to prevent fading, assists in repelling moisture and resists staining. We recommend Miracle Sealants' 511 Impregnator- available at most home improvement centers. Your place of purchase may also carry the product. To seal the top, use a slightly damp clean sponge or cloth. Simply wipe on the entire surface, covering all around the sides and wrapping around slightly underneath. Then wipe off (making sure to buff off the glass tiles). To clean the tops use a mild, non-abrasive dish soap and water. A product with ammonia will strip off the sealer potentially causing fading and or cracking. Our tops are suitable for outdoor use. However, we do suggest that they not be exposed to consistent freezing temperatures. Under these conditions we recommend bringing them indoors. When handling a top, make sure to lift and lay on a flat surface, NEVER roll it on its side. If storing the top on its side is the only option, make sure there is sufficient padding under the top and in between the surface it will be leaning against. If side of top gets marked, fine sandpaper may be used to remove scuff (making sure to reseal that area after). If sanding changes the color of the stone blend, you might decide to grout just that area and then reseal (instructions below). If side of top gets bumped and chips, you may mix a small amount of grout to fill in the area and then reseal (instructions below). Proper Care Eliminates Most Common Concerns Sealing a top regularly, keeping tops out of freezing temperatures, using mild soaps without abrasives and ammonias and handling the tops properly will minimize the need to re-grout your top. Due to the natural expansion and contraction of any cement like product, small hairline cracks may occur. This is not uncommon and will not affect the structural integrity of the top. If this does occur you may grout the top to fill in the areas. Seal the top 24 hours later. Efflorescence is a deposit of salts, usually white, formed on the surface of concrete. It is a substance that has emerged in solution from within the concrete and is deposited by evaporation and will lessen with time. The efflorescence is a natural part of the cement curing process and will in no way affect the durability of the product. Regrouting the top and sides, then sealing 24 hours after, will restore the stone blend to its original richness. When the top is originally created, there are typically small air bubble pinholes in the stone blend. We then put a skim coat of grout over the top and sides to fill in those little spaces. Over long periods of time or with improper care, those areas could become visible again. Applying a skim coat of grout over the top and sides, and then sealing the top 24 hours later, will make the top look like new. Over long periods of time, being exposed to harsh environments or improper care may result in the stone color fading a bit. Applying a skim coat of grout over your top and sides, and sealing it 24 hours after, will restore the stone blend to its original luster and richness of color (the glass, marble or travertine tiles will never fade). 1. Proportional to the size of your top, pour grout in a bucket or bowl and slowly add water to create a paste. If you can pour it, it is too wet - if it crumbles apart, it is too dry. 2. Wet sponge squeezing out excess water and wipe down table top. 3. Use sponge to smear a thin coat of grout over entire top. Make sure to wipe around the sides and wrapping slightly around underneath. 4. Let grout dry for approximately 1 minute. 5. Wipe grout from top using the sponge. Rinse grout off sponge and squeeze out excess water, repeating until the sponge is relatively clean. Make sure to remove any grout that may have collected on the underside of the top. 6. You may wish to do a final pass over the top's glass tiles and buff off any remaining grout using an almost dry sponge or dry cloth. 7. Let top sit in an area that will not get wet for 24 hours. 8. To seal top use a slightly damp clean sponge or cloth. Simply wipe on the entire top covering all around the sides wrapping around slightly underneath. Then wipe off (making sure to buff off the glass tiles).